The Paleolithic illustrations were found on 12 September 1940. One of archaeology’s most exciting discoveries was made by four French teenagers and possibly a dog. Versions of the story differ in detail, but Marcel Ravidat, Jacques Marsal, Georges Agnel and Simon Coencas came across a hole in the ground in woods near the village of Montignac in the Dordogne region of south-west France. Whether they had a dog called Robot with them and it chased a rabbit into the hole is uncertain. Another version has Ravidat finding the hole on September 8th and taking the other three back with him on the 12th. There was a local story about a secret tunnel that led to buried treasure and the boys thought this might be it. After dropping stones into the hole to get an idea of how deep it was, one by one they went cautiously down into what proved to be a narrow shaft. It led down 15 metres (nearly 50ft) to a cave whose walls were covered with astonishing paintings. Marsal said later that going down the shaft was terrifying, but the paintings were ‘a cavalcade of animals larger than life’ that ‘seemed to be moving’. The boys were worried about getting back up again, but they managed it using their elbows and knees. Tremendously excited, they promised each other to keep their discovery a secret and explored it again the next day. After that they decided to show it to friends for a tiny admission fee. The news quickly spread and so many people came to see the cave that the boys consulted their schoolmaster, Leon Laval, who was a member of the local prehistory society. He suspected it was a ruse to trap him in the hole, but when he went cautiously down and saw the paintings he immediately felt sure they were prehistoric and insisted that no one must be allowed to touch them and they must be guarded against vandalism. The youngest of the boys, 14-year-old Marsal, persuaded his parents to let him pitch a tent near the entrance to keep guard and show visitors round. It was the start of a commitment to the paintings which lasted to his death in 1989. Word of the discovery reached the Abbé Breuil, an eminent prehistorian, who vouched for the paintings’ authenticity. The sensational news spread through Europe and the rest of the world and in 1948 the family that owned the land organised daily tours that eventually brought thousands of visitors every year to see for themselves. There were more paintings in galleries that led off the main cave and they confirmed previous discoveries, which had showed that, unlike other animals, the first human beings believed in religion, magic and art. They buried their dead formally with equipment for another life and they may have believed in a great mother goddess, the source of all life. They seem to have had a deep sense of the numinous, of something outside human beings that is powerful, mysterious and uncanny. The paintings convey this. Dated to about 15,000 BC, though they may have been created over a longer period than formerly realised, they show bulls of the now extinct aurochs species, oxen, horses and stags as well as arrows and traps. Early humans were hunters and one of the purposes of the paintings may have been to bring about successful hunting in real life. There is a figure of a man with a bird’s head, perhaps a shaman, who carried out rituals in the cave. Recent theories link some of the paintings with constellations in the sky, including the Pleiades and Taurus, or connect them with ritual dancing, which can induce trances and cause visions. 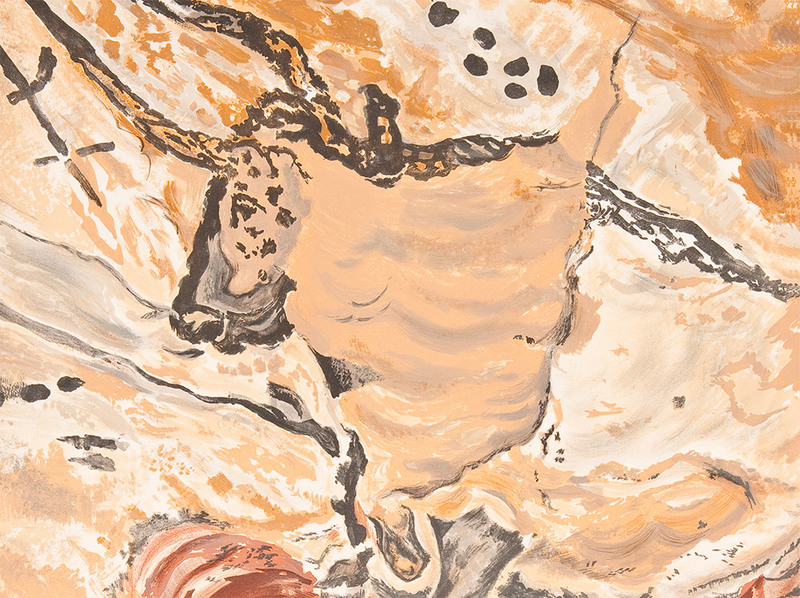 The thousands of visitors to Lascaux did not mean to harm the paintings, but they did, simply by breathing on them. The occasional visitor fainted because the atmosphere was so thick. Condensation formed on the walls and ceilings, moisture ran down the paintings and lichens and mould developed. High-powered lighting added to the damage and the paintings began to fade. Lascaux was closed to the public in 1963 by the French minister of culture, André Malraux, and only experts were allowed in. A replica of the site was built close by for the public in 1983 and draws 300,000 visitors a year. Efforts to halt the damage to the original paintings are continuing. In 2009 the French ministry of culture brought close to 300 experts from many different countries together in Paris to consider ways to halt the deterioration. Their recommendations were published in 2011, but misgivings about the site have not been allayed.